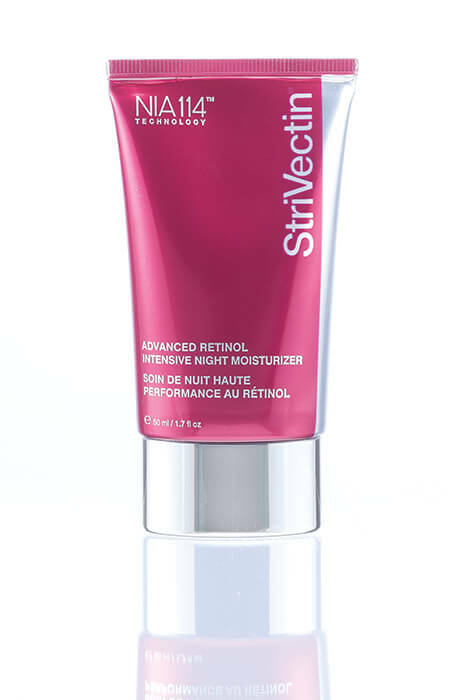 StriVectin-AR™ Advanced Retinol Night Treatment works harder and smarter to reduce the look of wrinkles and fine lines while you sleep. Anti-wrinkle cream plumps skin's surface to restore its youthful contour and evens tone for a smooth, radiant complexion. Safe for nightly use. 1.7 fl. oz. Use nightly on clean, dry skin. Apply over entire face, concentrating on areas of concern. Caution: For external use only. Keep out of the reach of children. Avoid eye contact. If product comes into contact with the eyes, flush well with water. Discontinue use if signs of irritation or rash appear. This product contains Retinol that may increase your skin's sensitivity to the sun. Use sunscreen daily. Aqua (Water, Eau), Glycerin, Myristyl Nicotinate, Butyrospermum Parkii (Shea) Butter, Caprylic/Capric/Myristic/Stearic Triglyceride, Di-C12-15 Alkyl Fumarate, C12-15 Alkyl Benzoate, Glyceryl Stearate, Propanediol, Myristyl Myristate, Steareth-2, Dimethicone, Jojoba Esters, Stearyl Alcohol, Steareth-21, Caprylic/Capric Triglyceride, Pentylene Glycol, Retinol, Retinyl Palmitate, Bisabolol, Sodium Ascorbate, Enteromorpha Compressa Extract, Sodium Hyaluronate, Panthenol, Hexapeptide-3, Aloe Barbadensis Leaf Juice Powder, Resveratrol, Tocopherol, Tocopheryl Acetate, Caesalpinia Spinosa Gum, PEG-40 Hydrogenated Castor Oil, Sorbitan Oleate, Butylene Glycol, Xanthan Gum, Acrylamide/Sodium Acryloyldimethyltaurate Copolymer, Caprylyl Glycol, Isohexadecane, Parfum (Fragrance), Benzyl Alcohol, Silica, Aminomethyl Propanol, Polysorbate 80, Disodium EDTA, Potassium Sorbate, Benzoic Acid, Sorbic Acid, Citric Acid, Phenoxyethanol, BHT, Chlorphenesin, Limonene. The unsurpassed performance of Retinol without the irritation. Sophisticated consumers concerned with deep-set and stubborn wrinkles, sagging skin, uneven texture and tone. Consumers who are unable to use retinoic acid due to irritation. For the first time, two of the most powerful anti-aging actives, NIA-114™ and Retinol, unite in one powerhouse treatment. For Retinol (vitamin A) to achieve age-fighting potency, it needs Vitamin B3 to convert to its active form. Strivectin’s proprietary NIA-114 molecule is one of the most active forms of Vitamin B3. Working as a dynamic duo, NIA-114 activates Retinol’s age fighting power to work harder, faster, smarter without the irritating side effects. So you get superior age-fighting benefits throughout the night to visibily reduce wrinkles, even out tone and texture, and nourish skin. I love this product. I have used the day cream in the past and loved that too. This is just as great. You can really see and feel a difference after the first night. My skin is so soft, and my wrinkles are less noticeable. I will be ordering this again for sure! I have been using it and like the product. I'm 66 years old. 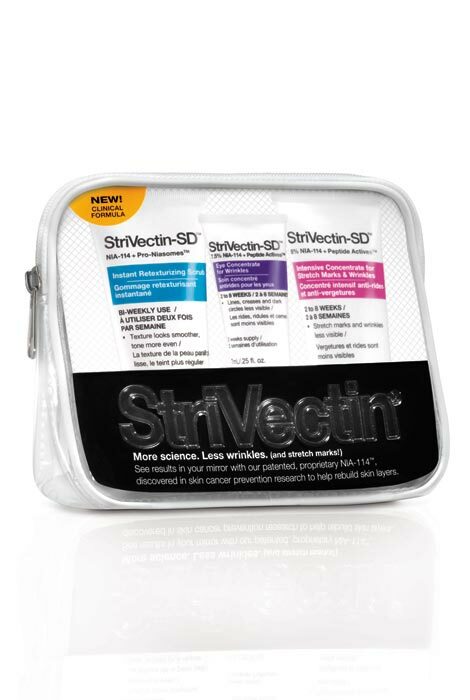 I have liked Strivectin products in the past. Not worth the money, the retinol cream for less than half the price works far better, will not order again. I am 74. It really makes a difference around my lips and frown lines. I have been using this night cream for over a year. I've been looking for a good retinol night cream. I hope it works! I am looking for a product that will improve my wrinkles. I have not tried it yet. What product will help redding nose and cheeks? BEST ANSWER: Thank you for your question. We have an item that may be of interest to you. A link is provided below. Please click there. We hope this information will be of help to you.